Fried rice forms an important part of Chinese cuisine. The Chinese food served outside China differs from the way its cooked in the country. The secret in making good stir fried rice is in using cold rice as the grains would be separated and wouldn't stick to each other as in the case if fresh rice is used. This is a great way to use your left over rice! This particular dish is healthy too. There are many ways to prepare fried rice.Rice can be stir fried with green onions, eggs, bell peppers or any other vegetables of your choice. You also can add your choice of meat. In some preparations spices like garlic are stir fried to impart a special flavour. Similarly MSG/Aginomoto is also used as a flavour enhancer. 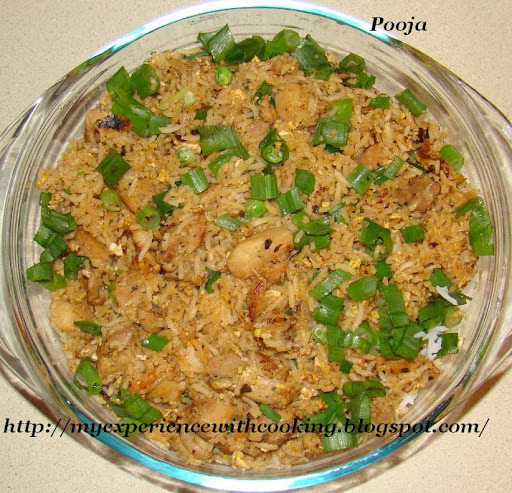 In this recipe I have stir fried- rice with green onions, chicken, eggs and frozen vegetables. Also in this preparation I used teriyaki sauce.Teriyaki sauce is used usually in Japanese dishes but this was purely a personal choice. The addition of this sauce gives a glaze for meat and vegetables. The technique behind stir frying rice with eggs is you need to add rice to eggs when eggs are about one fourth cooked so that finally when it gets cooked the eggs stick to the rice granules which enhances the flavour. Also before serving garnish the dish with freshly chopped green onions. The rice should be cooked in chicken broth with enough salt added. Marinate chicken pieces with ingredients mentioned under marinade and keep for about 30 minutes. Stir fry the marinated chicken in a pan till cooked. You may use any method for cooking chicken. Remove from pan and keep aside. Beat the eggs seasoned with salt and pepper. In the same pan that was used for cooking chicken add beaten eggs and cook. When eggs are about one fourth cooked add cold rice and stir fry till eggs are cooked well. Now add chicken pieces, half of chopped green onions, ground pepper, frozen vegetables and mix well in low-medium heat. Add soy sauce, ketchup, teriyaki sauce and mix well. Add the seasoning mix(vary the amount according to your taste) and stir well. Close with a lid and keep for some time before serving.